December 6, 2015: 1.5 hours, 3 children, ages 6–9. Pretty good class with some good teamwork this week. One of our families was away, so we had fewer children in attendance, but it was fun all the same. Instead of having them work in their workbooks, we had the children create their own personal prayer books, for storing prayers and quotes that they learn throughout the year. The point of these is to give the children something to read from when it’s time to say prayers. We picked up a book of craft paper, folded it around ten pages or so of lined paper, and punched holes in the side to allow us to bind the whole thing together with ribbon. They enjoyed the craft; let’s see how much use they get out of the books now that they’re done! The rest of the class went pretty well. The children were a little less eager to say prayers this week, but hey, there are on and off days. Studying the prayer and practicing the song were easy; the prayer was the same as last time, and the song was easier to learn than the previous one. We included a story and a game in the day’s schedule, but as the class progressed we realized that we were running out of time; we also needed ten minutes at the end of the class for a country presentation. So after we were done preparing the lesson, we ended up moving back over to the craft table to give them time to finish up their work on their prayer books. It’s a bummer, because we didn’t spend a lot of time on activities that directly supported the lesson—only the song was directly related, really. Hopefully we can do “part two” of this lesson next week, though, and make a little more time for the extra activities. (For instance, the capital Kinshasa has ten million people in it), what kinds of special foods people eat there, what language they speak, and what kinds of endangered animals live there. All in all, it was an engaging presentation that gave a good overview of the country. I must admit that I was skeptical about adding the country presentations to the class at first, but they all turn out to be pretty interesting, even if they’re not directly related to the topic of the lesson. It’s nice to have that extra element of cultural discovery in our classes, since it helps the children discover what’s outside the bubble of their own culture. I just hope we can make sure to focus enough on the topic during the rest of the class, which I feel like we didn’t do this week—that is, we spent a lot of time talking about things other than generosity. Maybe we can work on that next week; we’ll have someone in to do a presentation on Australia, so we’ll see how that goes. Categories: Education | Tags: Bahai Education, Generosity | Permalink. 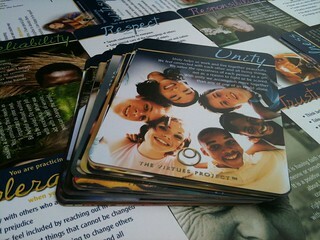 One of our new readers came to us with a question about using Virtues Cards (nifty cards featuring different spiritual qualities, created by The Virtues Project) in teaching groups of children. We just recently bought a deck of these cards ourselves, so we’re not experts by any means—but we’ve got plenty of ideas. One of the ways we can help people understand abstract concepts is through the use of storytelling and role play. These put otherwise abstract virtues into a very tangible context that adults and children alike can more easily understand and learn from. In fact, this is why the lessons in Ruhi Book 3 always include stories, and dramatic activities in Grades 2 and up: they model different spiritual qualities and practices, and help children to think about how they might show those qualities in their lives. So, as for how to use the virtues cards? Here’s the “experiment” we recommended to our friend. You can try it, too! Pick one of the cards and read the virtue’s definition and some of the examples. Ask the participants to think of a situation in which that virtue could be used; if nobody speaks up, you can suggest one based one the examples given. Then, ask them to create a story based on that situation, and ask them to break into groups and tell each other the story. Finally, bring them back together and ask them to create a short dramatic skit based on the story; practice it with them, and see how it goes. At the end, get them to reflect on what they learned about that virtue, and have them share any insights they may have had about using that virtue in their lives. The nice thing about this idea is that you don’t really need to buy a deck of cards to use it. You could just as easily write down the virtues yourself on sheets of paper, or blank index cards. Have you had any experience incorporating virtues cards into your children’s classes, or any other insights about teaching children about spiritual qualities? Categories: Education | Tags: cards, education, virtues | Permalink. It was only a few weeks ago that I was walking through school and some girls from my drama class ran up to me. “Oh God,” I thought as they hurried away giggling. This class in particular had earned themselves quite a track record in this respect. But they didn’t! Not this time. They bought me a card. Let us take a brief moment to acknowledge this. A bunch of 13 year olds, who most of the time couldn’t remember to bring a pencil with them to class, had actually gone out, found a card, written inside of it and brought it all the way to their last lesson with me. So I had thought that was the surprise, and maybe even they thought it was, but by no means was it the most precious thing they gave to me that day. I told them that because it was our last lesson, I wanted them to think back over our year together and choose some of their favourite drama games to play! You know, for the last time. I didn’t. So she reminded me. The game was called Pukanah. I remember playing it in our very first drama class thinking that all the rowdy Maori chanting, clapping and stamping would get us energised and be a fun way to break the ice! Instead, what I ended up with was a roomful of nervous 13 year olds, clapping awkwardly and BEGGING me to choose another game. So we didn’t do it again. I’d just figured it wasn’t their thing. But now they wanted to play! But this time was different! So much so, that as soon as we’d stopped I gathered them around to tell them all how incredibly proud of them I was. But one of them interrupted me. 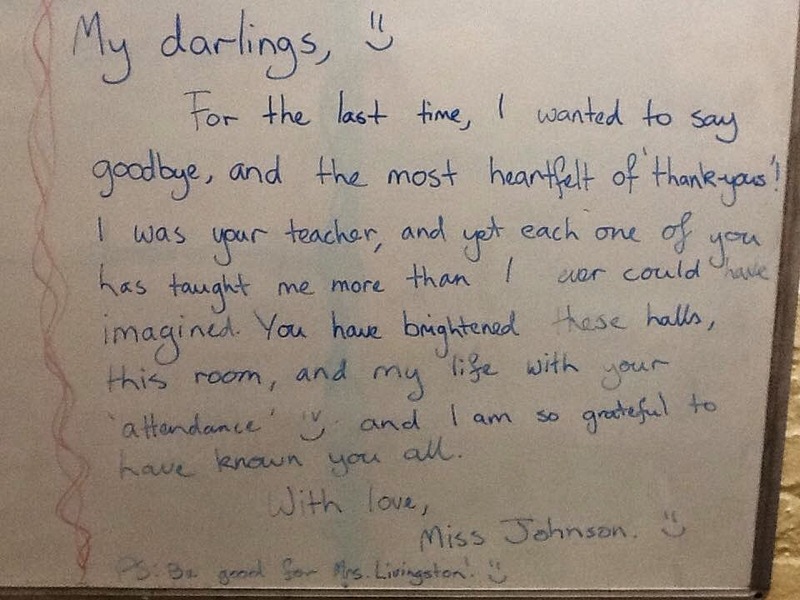 “Miss Johnson! Do you remember what happened the first time we played that game? Everyone started giggling and nodding at the memory. And how much they loved me. Because I loved them too. But by no means were they the only students in the room. The fact is that for the 7 months I’d been at that school, I didn’t always know what I was doing. And let’s be honest, I still don’t! But there are a couple of things I’ve figured out. And sometimes you don’t understand it until much later. But it’s there, in front of you. As the ‘quiet one’ in the room begins asking questions. So her friend with a sore finger won’t fall behind. Or an emotional group selfie. As late as it is! I will always remember this lesson. And I will never stop looking. Categories: Education, Teacher, Writing | Tags: Ingrid Johnson, Last Lesson | Permalink. Originally posted on Brilliant Candle. Previously, we highlighted an article describing the benefits of volunteering. But more often than not, we aren’t thinking of personal gain when devoting time to the service of others. Whether helping a neighbor or joining a global campaign to end hunger, living a life of service has the power to transform the world. Categories: Education | Tags: Volunteer | Permalink. I wrapped up another semester in my college career. I’m packing my suitcase for Arizona (and the Grand Canyon Baha’i Conference) and just finished writing out my Sub Plan for Children’s Classes on Sunday. Still I thought I’d take a quick break and leave you with two fun art projects you can do this winter break! Watercolor paper, watercolor paint (I used the 8 color crayola pan), brushes, white oil pastel, glue, single hole puncher and white scrap paper. 1. Using an oil pastel, draw a large triangle for the tree, a square or rectangle for the base, and a horizon line behind the tree. You will need to press down firmly. You can add light lines on the ground to represent snow banks. 2. 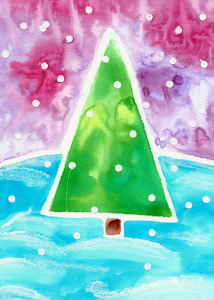 Fill in the tree with green watercolor paint. You might also add yellow or blue for dimension. Categories: Education | Tags: art project, craft, education | Permalink. Sorry for the novel guys, but had a very touching lesson yesterday, which I felt like sharing. I’d been noticing recently in some of my classes, that the language my students used with each other wasn’t always nice. This was worrying for me, because I know that habits formed at this age are harder to break later in life and will influence their character in quite a significant way. So I planned a lesson that made me quite nervous, because there were so many ways it could go wrong. Regardless, when they came in, I told them to sit down in front of an envelope and listen. I told them the story of my vocal disability, and the time I had spent as a mute. I told them all about how I had spent months listening to people yelling at each other from car windows or throwing hurtful words back and forth between them, and the devastation I felt for the ways these people were choosing to use their words. They were wasting them. Completely. Then I told them about the promise I had made to myself back then, that if I should ever get my voice back, I would never waste another word. They have the power to raise us up, to inspire, to heal, to encourage and to do incredible things to the hearts and minds of those around us… And that’s beautiful. So why would we ever choose to hurt someone with them? Anyway, I finished my little speech, and explained the next activity. We were going to pass our envelopes around the circle and every time a new persons envelope landed in front of us, we would take a moment to reflect on the things we loved about that person and write them a note saying something kind. Then we would put it in their envelope and pass it on. It made me so happy, looking around at this room of 13 year olds, as they scribbled furiously with their heads down and smiles on their faces, determined to brighten each other’s days in the biggest way possible. But it doesn’t end there. We were nearing the end of the lesson when one of the girls stopped what she was doing and looked over at me with a confused expression on her face. I was so thrown off by that question. I smiled at her and told her that it was okay and I didn’t really need one – but what happened next nearly made me cry. With no hesitation, she jumped up from her desk, strode over to my table and grabbed one of the spare envelopes sitting there. After writing my name on it she stood in front of the class, held the envelope above her head and boldly announced to the room that everyone needed to stop what they were doing for a minute and write Miss Johnson a note (since she had tried to be silly and not include herself in the activity). Then I watched as one by one my sweet, beautiful kids bounced over to my envelope to slip their notes inside. I actually love these guys. Later, when the class was over and each student had gone home with their envelopes filled with kind words, I sat down to read what they’d written to me, and I’m not going to lie, there were tears. Not one of them had said anything half-hearted or superficial. They had understood the lesson. Now, as a lot of you may know, a few months ago I had spoken to my head teacher about leaving my post in that school. It was a long and expensive commute, I wasn’t teaching enough classes to be working towards my full teacher registration and I had been facing a whole bunch of challenges working in that school. Also, as even fewer of you may know, earlier this week an advertisement went out in the public domain searching for my replacement. It wasn’t until this moment though, that I realized how much working with these kids truly meant to me. We had grown so much together. We were learning from each other, and suddenly I couldn’t imagine ever leaving them behind. So I said some prayers, ditched my pride and rushed over to the head teachers office to beg for my job back. I showed her the notes. The job is rough, and draining and easily the most difficult thing I’ve ever done. But I knew I was the best person to do it. Unfortunately, it was too late, and I know that now I’m going to have to live with the decision I made. But wherever I end up, these kids taught me something incredible. I don’t even know how to articulate what it is. But I know one thing now. Every moment I spend with them is precious, and fleeting. And for as long as I’m allowed to stay there, I’m not going to waste a single one of them. 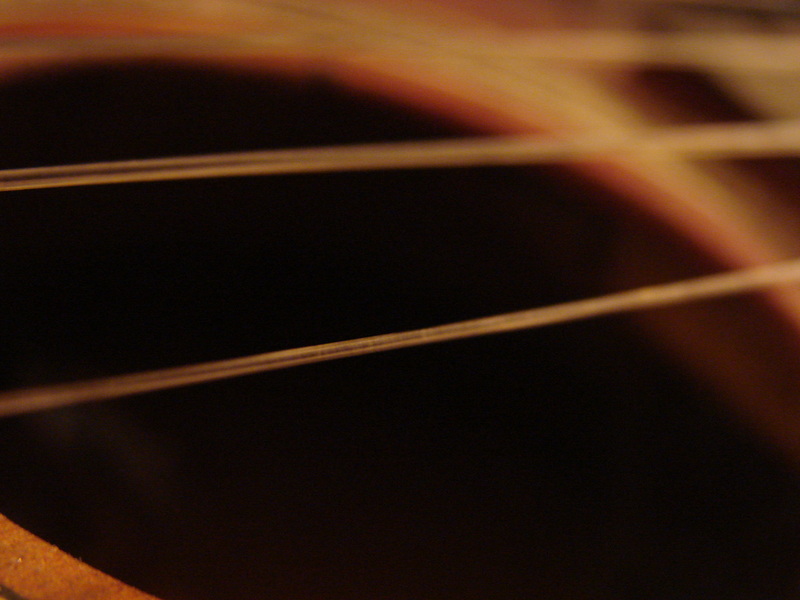 You can find Ingrid at her blog The Two Stringed Ukulele. Thanks for sharing your teaching experiences Ingrid. Categories: Education | Tags: education, power, students, teacher, words | Permalink.